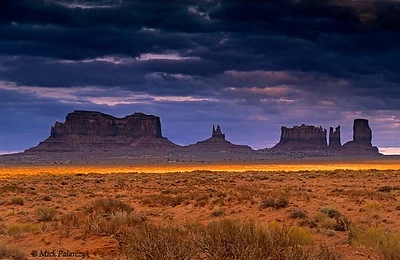 [USA.UTAH 28261 'Sunset at Monument Valley.’ A last ray of sunlight illuminates the plain at Monument Valley. Soft shales at the base of the buttes crumble under the influence of water and frost erosion, undermining the more resistant overlying sandstone which forms vertical cliffs when it collapses. The shales and sandstone date from the Permian period. Photo Mick Palarczyk. [USA.UTAH 28206 'Pleasant Creek.’ Cottonwoods in autumn garb line the banks of Pleasant Creek, a little river that periodically drains floodwater from the elongated depression of the Water Pocket Fold in Capitol Reef National Park. Here we are looking to the west with the western rim of the Fold on the horizon. Photo Mick Palarczyk. 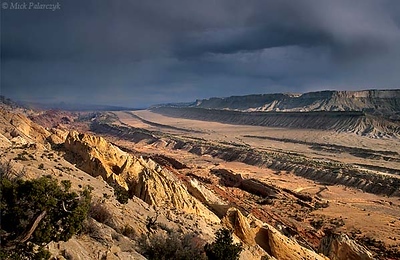 [USA.UTAH 28186 'Waterpocket Fold seen from Strike Overlook.’ In the Waterpocket Fold, a 65 million year old earthfold at Capitol Reef National Park, different rock-formations surface in straight lines. 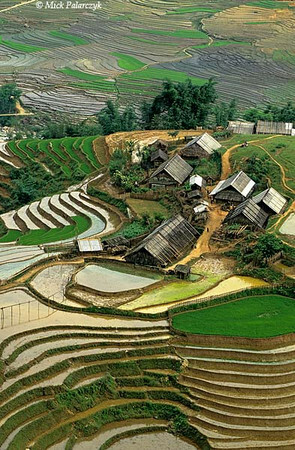 The geologic layers, which were originally horizontal, were formed from sediments deposited over hundreds of millions of years in seas, tidal flats and deserts. As wind and water continue slowly to erode the fold, new features are created from the rock. The view is from Strike Overlook, looking north. Photo Mick Palarczyk. 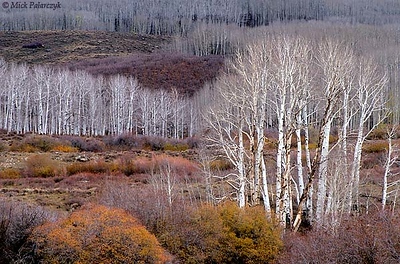 [USA.UTAH 28134 'Aspens north of Boulder.’ The white trunks of American aspens (Populus tremuloides) form a bright contrast with the orange and purple-grey undergrowth on the slopes of the Dixie National Forest north of Boulder. Photo Mick Palarczyk. 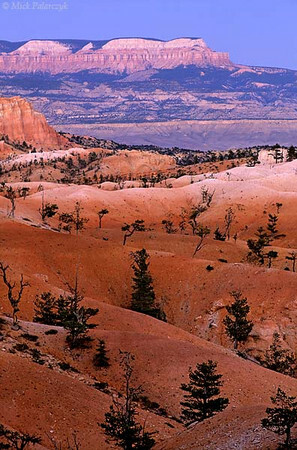 [USA.UTAH 28113 'Table Cliff Plateau seen from Bryce.’ Bryce Canyon National Park is famous for its weird landscape of pinnacles (hoodoos) which consist of a poor grade of limestone that is easily eroded by flashfloods descending from the nearby plateau. The eastern edge of the park shows the final stage of erosion: the spectacular towers are reduced to undulating hills of red ruble. In the distance you can see the valley of the Paria River with on the horizon the Table Cliff Plateau, ending to the right in Powell Point. Photo Mick Palarczyk. 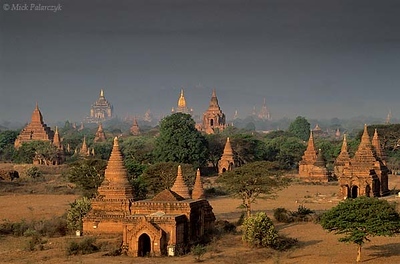 [BURMA 24.880] ’Bagan plain seen from Bulethi Stupa .’ The Bagan plain houses some two thousand temples and stupas. 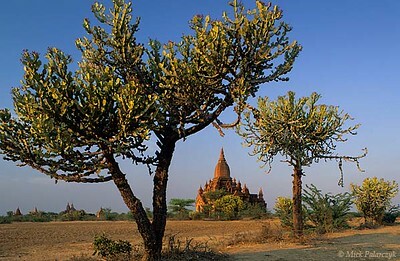 They are the 11th-13th century remnants of the now vanished royal city of Bagan. Here the plain is seen in the early morning from the Bulethi Stupa, looking west, with on the horizon the Thatbyinnyu Temple (left, with small golden spire) and the Ananda Temple (with big golden spire). Photo Mick Palarczyk. [BURMA 24.940] ’Cactoid trees.’	Cactoid trees near a small temple on the Bagan plain west of Pwasaw village. Photo Mick Palarczyk. 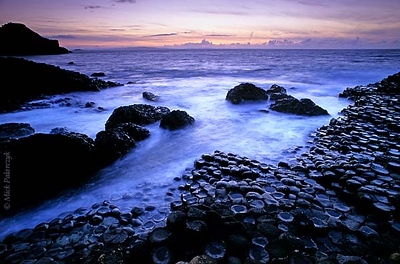 [BRITAIN.IRELANDNOR 21.853] ‘Natural hexagons.’	The hexagonal columns of Giant’s Causeway look like man made objects but are in fact the result of the cooling and shrinking process in a 60 million old lava flow. Photo Mick Palarczyk. 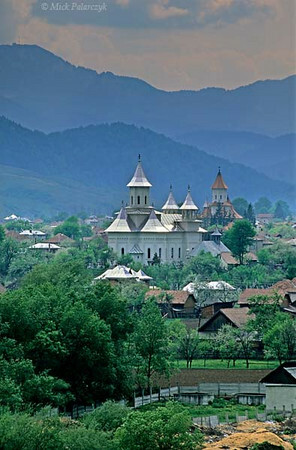 [ROMANIA.MOLDAVIA 23.979] ’Carpathian village.’	Behind the shining church towers of Vama shimmer the blue mountains of the Carpathians. Photo Mick Palarczyk. 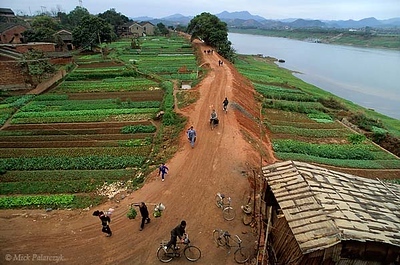 [CHINA.GUANGXI 25.439] ’Allotment gardens.’	Dike and allotment gardens along the West River near Wuzhou. Photo Mick Palarczyk. 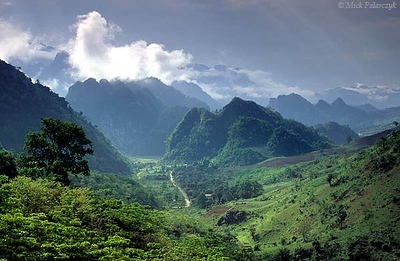 [VIETNAM.NORTH 21.354] ’Coned landscape.’	The landscape with wooded cones south of Lai Châu is the result of limestone dissolving in rainwater. Photo Mick Palarczyk. 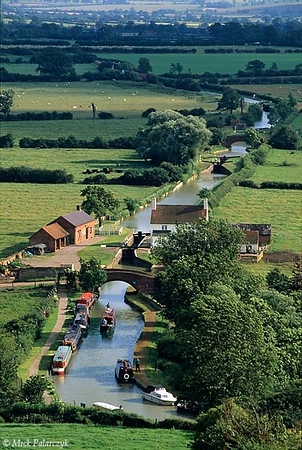 [BRITAIN.ENGMIDDLE 22.271] ’Bird’s-eye view of Oxford Canal.’	Near Napton on the Hill the Oxford Canal has a gently winding course through farmland. Photo Mick Palarczyk. [TURKEY.CENTRAL 26799 'Fairy chimneys in Görkün Valley.' The Görkün Valley south of the Cappadocian village of Göreme boasts some of the most spectacular fairy chimneys. The pillars consist of tuff (consolidated volcanic ash) that has been protected from rain erosion by a cap of harder more solidified ash (ignimbrite). Photo Mick Palarczyk. [TURKEY.CENTRAL 26858 'Eroded tuff near Uchisar.' 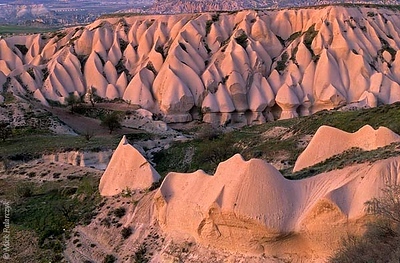 Erosion has turned these layers of volcanic tuff, north of the Cappadocian village of Uchisar, into a spectacular landscape of cones and curves. The slightly reddish hue of the tuff is exaggerated by the red glow of a setting sun. Photo Mick Palarczyk. [TURKEY.EAST 27875] 'Euphrates valley west of Siverek.' West of Siverek, a view northward along the Euphrates valley leads the eye to the distinctive Taurus peak of the Kimil Tepe (1222m) on the horizon. Photo Mick Palarczyk. [USA.UTAH 28222 'Landscape near Fruita.’ Landscape northwest of Fruita in Capitol Reef National Park. Photo Mick Palarczyk & Paul Smit. 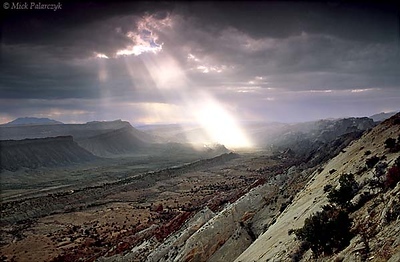 [USA.UTAH 28196 'Thunderstorm over the Waterpocket Fold.’ As a thunderstorm crosses Capitol Reef National Park, an isolated beam of light illuminates the Waterpocket Fold, a 65 million year old earthfold. The view is from Strike Overlook, looking south. Photo Mick Palarczyk. 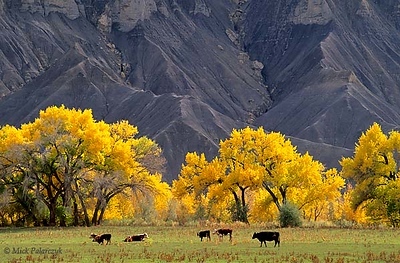 [USA.UTAH 28162 'Cottonwoods along Fremont River.’ The yellow autumn colours of Fremont cottonwoods (Populus fremontii) in the floodplain of the Fremont River form a stark contrast with the barren grey slopes of the South Caineville Mesa near the village of Caineville. The grey shale and sandstone is part of the Mancos Shale Formation and dates from the Cretaceous period. Photo Mick Palarczyk. 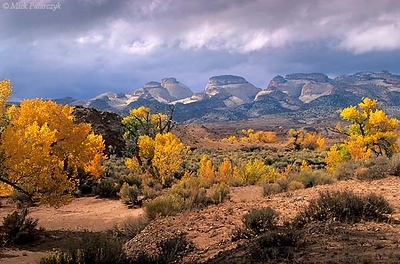 [USA.UTAH 28119 'Cottonwoods in Escalante floodplain.’ In autumn the floodplain of the Escalante River (seen here east of the town of Escalante) colours brilliantly yellow with the leaves of cottonwoods. The Fremont cottonwood (Populus fremontii) is exceptionally tolerant of flooding, erosion and flood deposits filling around the trunk. The tree derives its name from cottony structures around its seeds which allow them to be blown long distances. Photo Mick Palarczyk & Paul Smit. [USA.UTAH 28021] ’Erosion forms in Paria Canyon.’ In the canyon of the Paria River (a tributary of the Colorado) erosion has formed weird shapes in the local Navajo Sandstone. Photo Mick Palarczyk. 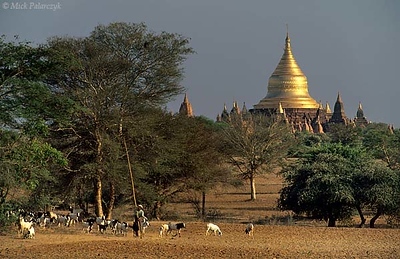 [BURMA 24.935] ’Dhammayazika Stupa.’	Near Pwasaw village on the Bagan plain, a shepherd leads his goats from one acacia tree to the next. He carries a long pole with a hook with which he shakes seed-pods from the trees that serve as food for the animals. In the background shimmers the golden dome of the Dhammayazika Stupa. Photo Mick Palarczyk. 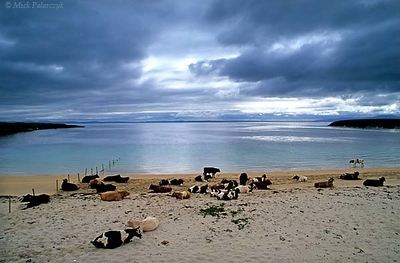 [IRELAND.DONEGAL 21.771] ‘Cows on beach.’	On the shore of Donegal Bay near St. John’s Point, cows have chosen a tranquil beach to ruminate. Photo Mick Palarczyk. 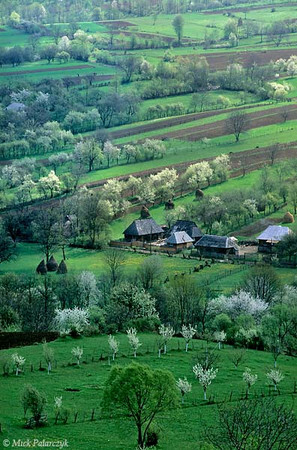 [ROMANIA.MARAMURES 23.671] ’Spring landscape.’	Surrounded by flowering fruit trees and roofed by traditional wooden boards the houses of Sîrbi are tucked away in the idyllic Cosau valley. Photo Mick Palarczyk. 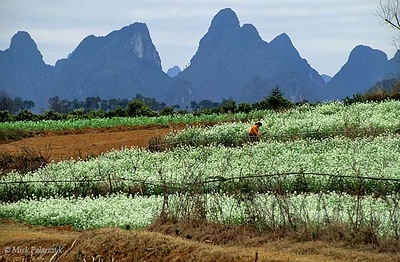 [CHINA.GUANGXI 25.323] ’Flowering fields.’	Flowering fields at the foot of lime-stone mountains near Shazi, 20 km east of Yangshuo. Photo Mick Palarczyk. [ANTILLES.stEUSTATIUS 25.620] ’Corre Corre Bay.’	Corre Corre Bay at the eastern tip of St.Eustatius is one of the loneliest spots on the island. Its coral laden beach seems just the spot to dig for a pirate treasure. Island-clouds formed in the rising air over St.Kitts are blown dramatically across the sky. Photo Mick Palarczyk. 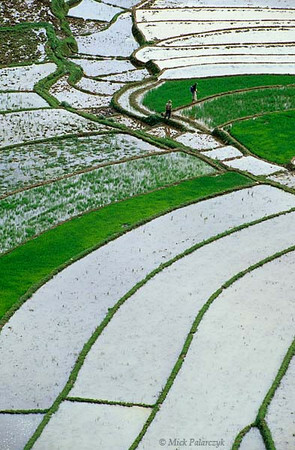 [TURKEY.CENTRAL 26895 'Zindanönü Valley.' 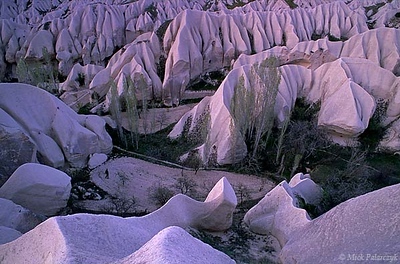 In the Cappadocian Zindanönü Valley, east of Göreme, small fields are surrounded by razor sharp ridges of white tuff. The tuff was deposited in the form of ash by nearby volcanos between 11 and 3 million years ago. Photo Mick Palarczyk. [TURKEY.CENTRAL 26903 'Melting mushroom.' This mushroom-shape rock, eroded from soft volcanic tuff, seems to be melting under the heat of the Turkish sun. 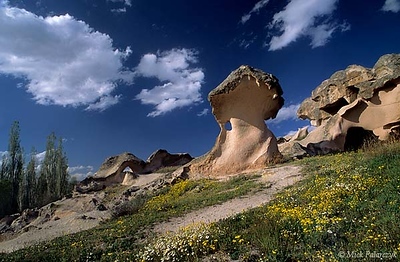 The strange rock formation can be found near Acik Saray, a rock-cut monastery south of the Cappadocian town of Gülsehir. Photo Mick Palarczyk. [BRITAIN.HEBRIDES 27688] 'Mud-flat on Great Bernera.' 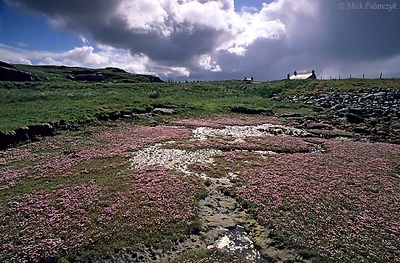 A mud-flat on the southern shore of Great Bernera is covered in flowers. The Isle of Great Bernera was linked to the north coast of Lewis by a bridge in 1953. Photo Mick Palarczyk.